Measures: 16.7 x 17.4 x 3.7"
Size: 16.7 x 17.4 x 3.7"
16.7 x 17.4 x 3.7" 19.7 x 13.6 x 3.7"
25 x 17.4 x 3.7"
Featuring sturdy metal construction and loaded with a full boat of advanced features, the MC120 Multi Color RGB, WW, CW Soft LED Panel Light from Rayzr is a 16.7 x 17.4 x 3.7" fixture with a wide 120-degree beam spread that can be controlled and contoured with its four-way barndoors, and while it draws just 118W, it outputs many times that number in tungsten equivalence. The MC120 has a white light color temperature of 2400-9900K and a high CRI of 95 indicating a highly accurate level of color fidelity. It's also got RGB, WW, CW mixing modes, as well as +/- Green/Magenta control to give you access to the full 360-degree color gamut and literally millions of color combinations. Light intensity is variable too from 0 to 100% and while you can make color and dimming adjustments locally on the light, you can also make them remotely from a console via onboard DMX, or wirelessly using Wi-Fi. For fine tuning and linear output in specific situations, the MC120 also has four user-selectable dimming curves - Linear is a 1:1 translation, Exponential provides fine control in the low end, whereas Logarithmic provides fine control in the high end. The S Curve is a combination of Exponential and Logarithmic. Yet another handy feature is the filter library that contains more than 300 widely used filters that can be employed with no light loss, and since all the filters are built in digitally, there are no gels to carry around. The MC120 also provides special effects such as Party, Candle, Club, Cop Car, Fire, Fireworks, Light Strobe, Lightning, and Television to add realism and creative flair to your shoot. Despite these eye-catching effects, the MC120 is seen but not heard, a benefit of its passive fan-less cooling system that's a real asset in sound-sensitive situations. The MC120 is ready for worldwide use thanks to its included multi-voltage power adapter, but you can also run the light on batteries when mains power is unavailable via the panel's V-Mount battery plate. With Source Match you can make your lighting more consistent and save time in post fixing non­-matching lights. A powerful light engine utilizes the strengths of RGB, WW, CW LEDs, enabling you to match any light source. Enter the x/y coordinates you measure and the MC series will be a match, bringing consistency to your lighting. 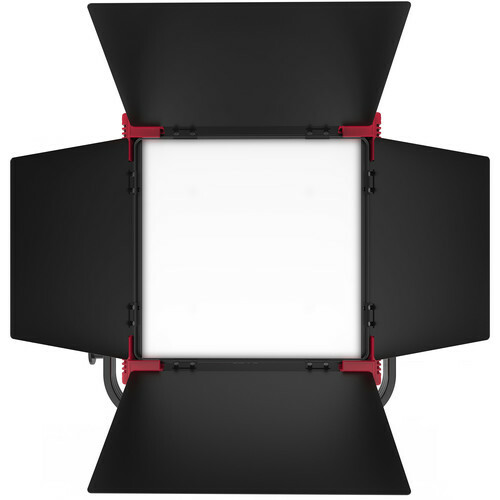 Adjust to a tint in other lights easily with +/- Green/Magenta compensation. The MC Panel gel library consists of more than 300 widely used filters available at your fingertips. No light loss, and since the filters are built in digitally, no gels are needed to carry around. The MC series comes with a wide range of built­-in adjustable lighting effects such as Party, Candle, Club, Cop Car, Fire, Fireworks, Light strobe, Lightning, and Television. Using the RGB, WW, CW LEDs for color but also to improve white light, the MC series offers accurate color rendition throughout its entire adjustment range. A fixed diffuser and a wide beam angle result in a uniform beam field and a truly soft light quality. The MC120 can be used in tight spaces and with little support. Its rugged metal housing makes it suitable for everyday use. Operate the MC120 for hours on location without AC power. All models come with a battery plate and can run on standard 14.4V V-­Mount batteries. The MC series is designed to be practical and easy to use with everything either built into the compact head or mounted to it by quick release for fast setup. With Wi-Fi and DMX built ­in, the MC series is easy to control and integrates well into any environment. A simple to use quick-release accessory system provides fast and easy mounting of light-shaping tools. Barn doors with extra­-long leaves are included with every panel. The metal housing of the MC120 series is designed and optimized for passive cooling through efficient internal airflow as well as a heatsink. The MC120 series are fan­-less designs. Four user-­selectable dimming curves provide fine-grained control in specific situations: Linear is a 1:1 translation, Exponential provides fine control in the low end, whereas Logarithmic provides fine control in the high end. The S Curve is a combination of Exponential and Logarithmic.